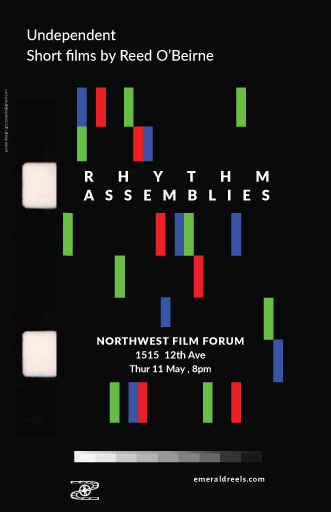 “Cinema has more to do with dance, than it does with novels,” says Seattle filmmaker, Reed O’Beirne, “because it is fundamentally rhythm and movement over time.” Join us as Reed screens a selection of short films from his 23-year career, including No Time For Shopping (2000), a dynamic look at the anti-WTO demonstrations in Seattle featuring a soundtrack by Tucker Martine; Last of Our Kind (2012), a modern interpretation of the Persephone myth featuring a soundtrack by Robin Guthrie; and Phantom Limbs (2015), a cameraless film created from animated MRI scans with a soundtrack by Seattle band St. Kilda. Biography: Originally from Natchez, Mississippi and now residing in Seattle, Washington, Reed is a graduate of the creative writing program at Vanderbilt University, and founder of Emerald Reels, an organization dedicated to supporting artistic filmmaking. Reed has organized hundreds of film screenings, and his films have screened widely at festivals and art events including the Ann Arbor Film Festival, AVIFF Cannes, and the Oxford Film Festival. His film, Phantom Limbs, won the best experimental film award at the 2015 Oaxaca FilmFest.